David’s international buyer audience has widened to New York and he continues to exhibit widely across England and London, with English, Scottish and International collectors. He was born in Hammersmith, London, to an English mother and Scottish father, and brought up in Sussex. He believes his regular family visits to Lanarkshire, Scotland combined with a childhood living next to Sussex Forests sparked his love of the space, feedom and transience found in natural landscapes. He has been invited to ‘ING Discerning Eye Exhibition 2017’, Mall Galleries SW1 and been selected for the Lynn Painter-Stainers Prize 2016′, has exhibited at the ‘Discerning Eye Exhibition 2015’, reached final judging of the Lynn Painter-Stainers in 2015 and has been pre-selected for the RBA Open, 2016. He has worked on the large scale sculpture works of Anish Kapoor and Anslem Kiefer. This experience, along with his correspondences with the Turner prize winner sculptor, Richard Deacon, developed a fascination of the poetry of sculpted form, space, shape and surface, which is reflected in his ideas of processes in painting. After graduating with a BA Hons degree in Art from Manchester Metropolitan University He became an artist, a sculptor, lecturer and then a Landscape Painter based at the Phoenix Brighton Arts Studios. Here and on site, he paints landscapes and panoramas. He won Sussex Life/ Paint Out – Landscape Painter of the Year 2016. He has been featured in Saatchi ‘Art artists to look at – Invest in Art, 2015, Saatchi Featured Artist, 2016 and ‘Saatchi Art’s ‘Artist of the Day’, 2016. In 2015, he donated a work to the ‘Big Heart Auction’ at the Brighton Dome. He has been invited to gallery exhibitions and art fairs and has collectors in London and across the South and Midlands of England, and has work in collections as far as Sydney, Australia, China, Europe and the USA. Painting outside gives a freedom allowing even a small painting to have a large sense of space. 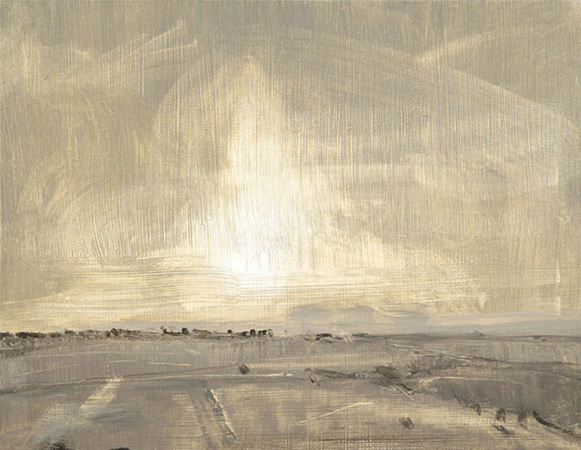 A painting of a landscape ‘en pleinair air’ (painted outside) is a live record with an intuitive way of painting, which helps to bring the viewer in closer to the painting and its surface by use of a first-person narrative. What I feel and think about the scene and what is communicated when the painting happens is somehow stored within, in a way that goes beyond the initial intentions of compositional choice or pre-selected colours. I think a live, quick outcome like this allows the paintings to be readily open to interpretation and then re-interpretation from viewers. Sometimes in the studio, I layer paint and glaze which leads to stages of creation and destruction causing new surface tensions and new colour harmonies. The colours that are an on-going process, are in part formed by the use of memory, and in part form the use of subsequent new discoveries made afterwards in the studio. When developing the paintings this way, elements of the original on-site marks are purposely left visible underneath. The over-painted semi-abstract marks, layered glazes and built surfaces help to communicate latent essences that I have remembered of the original on-site experiences. Often the paintings are taken back outside to the original sites and painted further. Influences – Kapoor, Kiefer, Diebenkorn, Patrick Heron, Kirkeby, Rose Hill, Martin, Macgill, Rembrandt, Corot, Turner, Klimt, Enkaoua, Gallen-kallela, Matisse, and Eardley. David wrestles with painting and his perceptions of a scene, and the painting process with which to grapple each live event in an en plein air session. He has to quickly respond, with little chance of turning back, to the changing time, atmospheric conditions, light and movement. He believes that regularly painting outside and revisiting locations helps with fluency and brings immediacy to the painting to better represent the transience of life and our connection with nature.